Whenever a new collection by a spiritual poet sees the light of day, it is as if Poetry itself were reaffirming its presence, in that endless process of self-generation and regeneration which art is. In fact, poets and artists place their minds and bodies, and very often their whole lives, at poetry’s and art’s disposal. They let themselves become channels. Yet, theirs is not a passive submission, it is on the contrary a very active one, sometimes involving a hard struggle. It is a double-sided submission: they accept it, even seek it out and they let themselves be flooded by silence and void in order to be filled by whatever might come from what Harpur has called elesewhere the Fountain, the source: inspiration. From there onwards, the hard work begins. 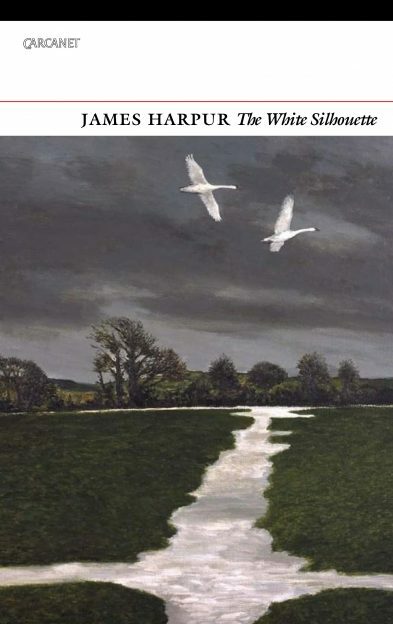 The White Silhouette (Carcanet, 2018), James Harpur’s latest collection is, in more than one way, the summa of his poetics and spiritual views. Its tripartite structure – the sections are called ‘The White Silhouette’, ‘Kells’ and ‘Leaves’ – reflects the direction his poetry has taken in the last few years, following a process of incessant, almost relentless analysis of the nature of poiein, this uniquely human activity which, to the ancient Greeks meant to ‘make’, ‘create’, with poetry being considered the supreme form of art. It is a process that Harpur began right from the start of his poetic career with his first book, A Vision of Comets, and which is still in progress. Thus, to all his readers, it will be clear that The White Silhouette should be regarded as a guide and an a posteriori introduction to all his previous works. The first section of the book, ‘The White Silhouette’, is devoted to a journey through art, sacred art (Rublev’s icons for example) – the theme of sacred art actually permeates much of his poetry – culminating in the title poem, which describes a lifelong dialogue with an invisible, elusive, silent entity, pursued through different lands and times, including Wiltshire and Patmos, which can only just be glimpsed at the end of the journey, when and if the self does not interfere anymore. As if they were on strings, like Chinese kites. Into letters of Hebrew, emblazoning the night. I’d know my destiny on earth. Instead I woke, as puzzled as Belshazzar. The central section, ‘Kells’ (of which more later), is an exploration of the genesis of this prodigious illuminated Gospel, of the anonymous Irish scribes’ souls and personalities and, at the same time, of the genesis of art itself and the consciousness of art-creating individual. And that exploration takes place in that mysterious sphere of creation which is itself the constant fight between matter and spirit, a fight which can only be appeased by annihilating that opposition – along with the ego or self – through the visionary, creative power of the Word. ‘Kells’ is a dialogue – rarely simple – between the I and the soul, that same dialogue which can be found in the title poem. The title of the third section, ‘Leaves’, is inspired by lines of Homer’s Iliad (VI, ll.146-50): ‘our lives are like the cycle of leaves. / The wind scatters the old leaves across the earth / then spring returns and trees put forth new growth…’ and features some poems from his sequence In Loco Parentis, a sort of Harpurian Telemachy, a squaring of accounts with the past, where the themes of loss and of retracing the origin of one’s process of individuation are treated. This third section includes some of his translations from Horace as well as the touching ‘Letter to Charles Harpur’, which I will explore further on. James Harpur, whom I’ve elsewhere called ‘the ascetic of Light’, is a spiritual poet, and I would venture to say, a metaphysical poet, in that his poetry is, line after line, poem after poem, a thirsty and yearning investigation of the Sacred. Communicating with the abyss, with something beyond, entails communicating with the Sacred, the sphere where poets and poetry live. When reading James Harpur’s poetry, it becomes suddenly clear that this is the function he ascribes to poetry, and more so in the poems ‘The White Silhouette’ and ‘Kells’. I have been Harpur’s Italian translator ever since I happened to read the first version of ‘Kells’, more than 13 years ago. At that time the poem bore the title ‘Voices of the Book of Kells’ and it was quite different from the one published in this collection. It differed not in its four-part structure, or in its quest for a deep understanding of the Book, a long journey searching for an access code to it and to creation. It did not even differ in the themes which are central to his poetry, that is to say an investigation into the very nature of art – especially sacred art – and whether it can lead to enlightenment or to a state of higher consciousness, and also the idea of poetry as journey, or pilgrimage. What is different between the first and last versions of the ‘Kells’ poem, altogether different, is its form and the point of perspective. Now the poet’s direct voice can be heard, speaking in the first person, interwoven into the tapestry of the poem and interlacing with the poem’s other characters (who include a Kells illuminator and a scribe), just like the knots and spirals of the Book of Kells images. Also, the original themes have been elaborated, pondered over and considered from new perspectives – not only in this final version of the poem, but also throughout all his poetic work since. The result is an amazingly shiny, glazed mosaic of thought, words and imagery, which projects its light into the depths of the Book of Kells’ structure and conception with an absolute modern, essential language. When I read that first version for the first time, I felt thunderstruck, it was an epiphany. The Book of Kells I had seen in Trinity College Dublin was there, translated into poetry, in all its mysterious glory. Words as crystalline and as luminous as the images themselves penetrated into the depths of the Book, went back to its origin, into its illuminators’ and scribes’ minds, beyond time and space. So I immediately did what I always do when confronted with a text that has captivated me: I began translating it. That is my only means of understanding a work more deeply, of penetrating its structure and retracing, somehow going backwards, its creative process. Harpur’s poetry has never left my life since. I also had the privilege to read, and immediately translate, the second version of the poem as well, so I can say that I have witnessed from the inside all the different phases and stages of the making of this work of art. My first impression on reading this third and final version of ‘Kells’, was that of a path, a winding path – and a pilgrimage – which the reader follows together with the poet, guided by him like a new Virgil, in order to reach a higher state of consciousness through the four stages the text offers. This path is much more stressed and openly declared in this last version. Thus, ‘Kells’ is a form of meditation, because this is what Harpur’s poetry is. A prayer addressed by a mystic to the Sacred, to the Divine through art. And yet, nonetheless, it is also a philosophical exploration of the fundamental questions of life. From that first ‘Voices of the Book of Kells’ to ‘Kells’ there is certainly an evolution, which could be described as a movement from the periphery to the centre, from the periechon to the core. From the It to the Self; a Self which is not personal but universal. The philosophical background is Neoplatonism, especially Plotinus’ thought, which is also the ground where James Harpur moves as a poet and a thinker. But then there are Teilhard de Chardin, John Scotus Eriugena, Jiddu Krishnamurti, Abbot Suger de Saint-Denis, Bernard of Clairvaux, Yeats and St Augustine, whose voices are all whispering in his ears, activating an inner process of poetic individuation. For Harpur is one of those rare poet-philosophers to whom poetry is a sonic depth finder, in the true sense of the expression. In the fourth and last part of ‘Kells’, the divine feminine Verbum manifests herself as a mysterious presence and is of great significance. In fact she resembles the Haghia Sophia, or the Pneuma, the supreme universal intelligence, speaking in an enigmatic language. By embodying an ineffable ultimate reality it in a female figure, Harpur enhances its creative and generating role. And yet, the Verbum, the Word, remains invisible and elusive. Paradoxically, although she speaks, she is actually the Silence from which all words and worlds eternally emanate and to whom they return, in an endless circular motion. all sense of what ‘beyond’ can mean. and travelling inward all the time. but silence, a perfect stillness. After reading Harpur’s ‘Kells’, I suddenly realized that the Book of Kells’ illuminations were reminiscent of quantum physics. Although, alas, I’m terribly ignorant about this subject, I think one can recognize, in the overall conception of the Book and its vibrant kinetic decorative style, some of its fundamental principles, like the fact that everything is made both of waves and particles. Although some of the Book of Kells illustrations are rigorous architectural structures, such as the Eusebian Canons tables, and there are full-page images of the Evangelists, of the Virgin with Child and of Christ, a good part of the decoration is carried out in the intricate ‘insular’ style, with a variety of motifs invading frames, empty spaces, and almost giving the impression of self-generation. It’s a style which can be recognized even in the flowing locks of Christ on the page that shows him being tempted by the devil. The overriding impression is that of a space brimming and pulsating with a wavelike energy. The sacred Word emanating from God is not only written on the vellum, but can be visualized as the image of the created universe. Also, the intricate paths of the lines, separating themselves and constantly bifurcating, abruptly taking different directions leading to different aspect of reality, are reminiscent of Hugh Everett’s Many-Worlds Interpretation (MWI) of quantum mechanics, according to which every event is a branch point; so, in Everett’s reading of ‘Schrödinger’s cat’ theorem, the cat is both alive and dead, even before the box is opened, but the ‘alive’ and ‘dead’ cats are in different branches of the universe, both of which are equally real, but which do not interact with each other. Quantum physics also deals with a microscopic reality. And if we analyze the amazing details of the Kells’ illuminations, we soon realize that many of the largest images, or their frames and decorations are composed of millions of lines, motifs, knots, tangles and entanglements (a quantum mechanic term as well!) sometimes so tiny – and yet so amazingly perfect – that they can be seen only through a magnifying glass. Because magnifying glasses didn’t exist in early medieval times, it still remains a mystery how the makers of the Book of Kells achieved such small details. And this was perhaps the reason why the medieval churchman Gerald of Wales reported that the Book of Kells must have been created by angels, not by human beings. Harpur’s ‘Kells’ explores the very most hidden depths of the Book, showing how the anonymous illuminators and scribes who created it had in mind to make visible the invisible, to infuse spirit into matter, to make eternal what is transient, and to express the ineffable through forms and colours, so that the divine energy could be transformed into matter and matter into divine energy. A spiritual version of the Relativity theory made visible. But, at the same time, Harpur relates all this to the human journey and to the nature of the creative process. Coupled with ‘The White Silhouette’, ‘Kells’ offers us a guide to the quest of the human soul seeking the truth, the One, or enlightenment. Some last, brief considerations about the poem ‘Letter to Charles Harpur’. Some time before travelling to Australia to receive the Vincent Buckley Poetry Prize in March 2017, Harpur took a deeper interest in Charles Harpur (1813 – 1868), an Australian born poet of Irish origin, who bore his own name (and whose facial looks, I may add, have an incredible resemblance to his own!). Charles Harpur was a spiritual poet, with an abundant, sensitive and sometimes highly original poetic oeuvre, who suffered a hard life, marked by tragedy and by limited literary success, although today he is celebrated as ‘the father of Australian poerty’. The poem James Harpur has written about Charles, (who by strange coincidence also translated the Homeric verses from the Iliad about leaves and human mortality), sounds like a very intimate dialogue with another part of himself and is full of tenderness and compassion. But, at the same time, it is Charles talking to him, from another world and another time. Charles is looking at James as much as James is looking at Charles. or wide warm fields, glad with corn. and tried to open people’s eyes. to some divinely universal end. seemed a blessing in the end. It must be quite peculiar to find a spiritual ancestor, possibly related to you, (there are very few Harpurs spelled ‘ur’ in Ireland, especially with Protestant ancestry), having the same name, a similar aspect, a similar inspiration and a similar poetic gift. It is like a mirror you look into to contemplate your inner side. This poem is a double mirror, for two poets, each the other’s anam charaid, or soul friend, who have met in the spiritual realm they share and which makes them contemporaries. A realm Harpur calls Home. James Harpur’s poetry is moving, in the sense that moves, stirs something deep inside you, not just emotions or feelings, but more like a process of guided enlightenment. At first you are dazzled, then stunned, then you fall into darkness, then you feel comforted. Finally, that darkness where he let you penetrate, is suddenly brightened, sometimes by a dim, sometimes by a flashing, yet always unexpected light. Harpur is both a very modern and a timeless poet, because through his verses, his saints, his mystics, his Greek and medieval philosophers, his angels and artists, through his dialogues with his inner self, we can recognize hidden parts of ourselves and the doubts and uncertainties we are confronted with in the troubled times we are living in. That is the pilgrimage Harpur guides us through; the one to ourselves. The path Home. So, yes, we can answer to one of his central questions: spiritual poetry, sacred art, can and does lead to enlightenment. I would like to thank Richard Bright for his generous hospitality on this mine of ideas which Interalia, is and of course James Harpur for being a beacon of inspiration, wisdom and knowledge. Translating his poetry has been a challenge right from the start, as its crystal beauty, its musicality, its craftmanship and its highly learned background required a total commitment, of the mind as well as of the heart. And yet, it has never been other than joy. While translating his poetry I learned so much, both as a translator and as a human being. Perhaps the greatest challenge was to find a voice in Italian, that could render as best as I could, his original one. I tried my best but, the best way I could find was to try and listen in silence to ‘the sound of one hand’ which Harpur’s poetry is.